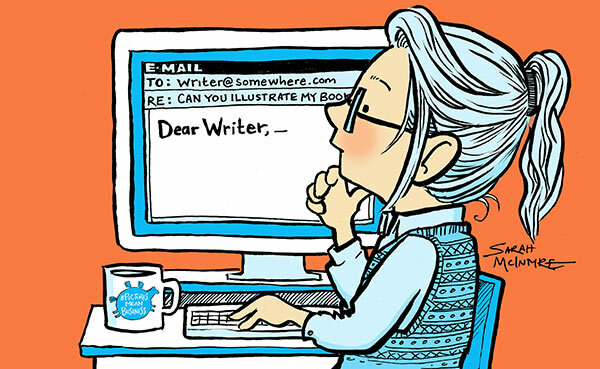 I've been getting a lot of e-mails recently from people wanting me to illustrate their books. They tend to be people who have come up with their first story, tell me they love my work, and are keen to get things moving. That seems sensible and I applaud them taking initiative. I think it's awesome when people love books enough to want to create their own and I feel honoured that of all the thousands (tens of thousands?) of illustrators in Britain, they want to work with me. This all sounds very positive. But there's a hitch: the strange thing is that, if I take time to write a thoughtful explanation of why I can't illustrate their book, and point them to helpful links, the best I usually get is a curt reply, almost never thanks for my time. Often I'll get a nasty response. It makes me think I've shattered their dreams and I ALONE am responsible for this and should feel guilty. (I never write a second reply to these.) But I wonder if it would be better not to reply in the first place; it's an awful feeling, putting time into trying to do something right, with the only result being that I annoy someone. Yikes! 1. The Chancer penned a little ditty last night and read it to their kids, who loved it. They thought, 'Hey, that was easy, why not try getting it published? Get rich as JK Rowling?' You wouldn't believe the number of people who find out I'm an illustrator and immediately ask me to illustrate their book before they've even written a story or seen any of my work. I might illustrate medical textbooks for all they know. 3. The Thoughtful Business Person is the most likely to get published and the most rare: a person who has been thinking about getting work published for quite some time, has researched the industry, has a good sense of the other new books on the market that are similar to the ones he or she wants to get published, has tried their best to get to know other people in publishing (often through the Society of Children's Book Writers & Illustrators). This person understands the work's creative but also a business; they take any news from me professionally and express gratitude for any time, tips or constructive criticism I give them. I often run into these people later at events or book festivals when they're promoting their newly published books and it's a pleasure to hear how they're getting on. You might be a writer who's hoping to get into the business. As a writer, your job is empathy, writing things from other people's perspectives. What I want to point out is that, if you want to achieve any success, you need to apply this skill - having empathy - with the people you want to work with. I can empathise with you: I've been in that position of wanting to get into publishing but not quite knowing how to go about it and making mistakes. But sometimes people gave me advice that helped me not make too many mistakes. So here we go, I thought I'd better explain how the business works and maybe help you see a few things from an illustrator's perspective. If you've written to me, I might have sent you a link to this blog post. 1. You don't actually need me: if you're a good writer, you're in luck! There are fewer good writers than there are good illustrators. Unless you've started out with a partner who's integral to what you're making (like I did with David O'Connell and Jampires, or Philip Reeve and Oliver and the Seawigs), you don't need to find your own illustrator; your target publisher knows lots of them. (My agent will back me on this, and I've been successfully paired with Giles Andreae, Gillian Rogerson, Claire Freedman, Anne Cottringer and Alan MacDonald, none of whom I'd previously known.) Editors and art directors don't just take your book and print it; they're active in creating it with you. Part of their job, and what they pride themselves in doing, is matching you up with the illustrator who's perfect for your story. If they've never worked with you AND you're pulling along an illustrator they've never worked with, that's two unknowns for them, and that's a much bigger risk than taking you on and pairing you with an illustrator they know does good work and meets deadlines. Read the Writers & Artists Yearbook (updated annually, often available at public libraries) and learn how to put together a very professional looking manuscript and cover letter. SCBWI Conferences are packed with helpful seminars, and their quarterly magazine (which you get with your membership) has helpful articles. Having done your research, you'll know exactly which editor to send it to, by name. And yes, this does take time. 2. Career illustrators can get scheduled tightly to book fair deadlines. We'll have a contract agreeing to have, say, a picture book ready for Bologna Children's Book Fair. We'll have another contract to have a picture book ready for Frankfurt Book Fair. Maybe we even have another illustrated chapter book due for Bologna. For the amount of time I take to illustrate, I can confidently do two books in a year; three books pushes me to the breaking point. Even if an illustrator wants to work with you, the scheduling means your book with them might not come out for three or four years. You can read this in-depth blog post about what career illustrators (and writers) actually do for a living. I estimate that I only get to spend about 30% of my working time actually illustrating books. Thanks so much for this post. I'm an illustrator (mostly editorial) and so much of it rings true. I have been asked by both friends AND family to illustrate their kids book ideas! It's so awkward saying no but I try to do it immediately and as politely as possible now just to nip it in the bud. The irony is that I'd love to do my own picture book. I have a story, but have no time to get going on it, let alone other people's. So it was very refreshing reading your advice and will help next time I'm in this predicament. Thank you! Your article is VERY helpful. I've been wondering how to connect with illustrators without being annoying and will follow your advice! Thanks for this article, it's very well said. I'm going to link this from my website if that's ok(I'm an illustrator also) and though I don't get very many of these queries, I would love to be able to direct people to read this first. So far I always take the time to write a full response, but often get no reply. So I think a new strategy is needed!